Now, Dear Readers, I can see people scratching their heads even at this distance, but even if all you have is an `10×15′ garden, you probably have issues with your soil – nematodes, blight (early or late, take your pick), weeds, you name your poison. For every problem you have, organic farmers have it, times 1000. Even conventional farmers, with all the chemicals at their disposal, have issues as organisms become impervious to them. Conventional potato and strawberry farmers, for example, chemically fumigate their fields on a regular basis because of blight and other diseases (not exactly an appetizing thought but we’ll move on). That is, until the chemicals don’t work anymore, which is a huge problem. Enter, Mustard. 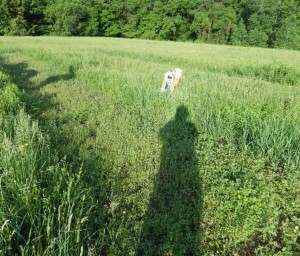 Actually, enter mustard and other cover crops but this post is about mustard. Mustard is a member of the brassica (cabbage plant) family. Other members that you’ll be familiar with are the various cabbages, broccoli, kale, cauliflower and so on. All brassicas, more or less, have compounds in them which make them taste ‘hot’ or ‘spicy’. These compounds are called, glucosinolates. If the plant cells are harmed – opened up by chopping, mashing and so on, they will release the glucosinolates. If this takes place in soil, soil enzymes (myrosinase) will combine with the glucosinolates and if there is water present in the soil, a gas is produced, called isothiocyanate results. This gas has the ability to kill soil-borne diseases, suppresses weeds and kills seeds in the soil. If you have weed seeds in the soil, it will kill them or prevent them from germinating. On the other plus side, mustard has very very long roots and will work to pull up minerals out of the subsoil and it also adds huge amounts of biomass. A plant to love for sure. So, how does this work, exactly? Bed No. 1: Till it up and give it no other treatment other than lime before we plant into it. Bed No. 2: Till it up and cover it with black plastic, add lime, till and then plant into it. Bed No. 3: Till it up, plant mustard into it, and once it blossoms, add lime, till everything in and wait the requisite two weeks before planting (I’ll discuss this more below). Bed No. 4: Till it up, plant buckwheat into it, and when it’s up, add lime, till everything in and plant into it. Every bed will have the same things planted into them in the same amounts. We’ll see how everything does at the end of the summer. So how exactly does this work with the mustard? Top photo is the mustard bed. The mustard was really not very tall – I’ll bet that’s because we did not lime the beds before we put in the seeds. One minus point for the DH and moi. This is the first part of the process: liming. Now, what we’re using here is wood ashes – which contain a lot of lime. They also contain phosphorus and other minerals but they can be a good source of lime. Ours comes from wood pellets that we burn in our heater – they are just wood pulp that is held together with a little moisture before they are created and dried. Literally, this was done by hand with a shovel, just like a gardener would do it. A big commercial farmer would have a spreader on the back of a tractor to do the job. Tractor, we’ve got. Spreader? Nyet. What you’re looking at here is a tiller on the back of the tractor, chopping up the mustard and tilling it into the soil. 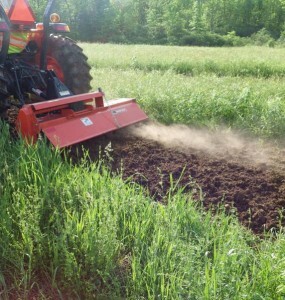 Chopping up and tilling it in. Right? Release those glucosinolates, baby!! The DH did another couple of passes on all the beds to make sure the buckwheat and mustard were combined well with the soil. Now, why did we perform this task at this precise moment? The weather. It’s now June – we really need to get the vegetables into the ground this month. We also need to make sure that as soon as possible once the tilling is done on the mustard that we have rain so that the glucosinolates can combine with the soil enzymes and have enough moisture to complete the reaction, create the gas and do the biofumigant job in the soil. 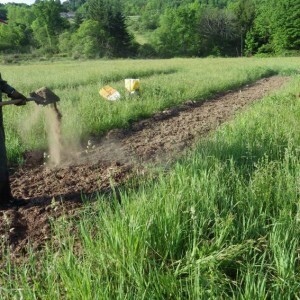 We did the tilling yesterday – it started raining last night. It’s raining today. It’s going to rain every day through Wednesday. Take that, soil diseases. I’m counting today as Day One – I know two weeks from today, we’ll be safe to put seeds in the ground. If there hadn’t been any rain, or not enough water in the soil, we could end up with poor germination or no germination at all if we tried to put in seeds. Now, if I’d had my druthers, I’d have done this in April, because mustard grows really well in cool wet weather, but we had snow and nasty weather the entire month and couldn’t get to it until things got nicer in May. So, we’re a bit late getting started, but we might get lucky at the after end. So, as gardeners, at home, what does this mean for you? Well, if you have issues with potatoes or tomatoes with blight, or nematodes or whatever, you can get yourself some mustard seeds (look on sites such as Territorial Seed under ‘cover crops’) and early the spring next year, fling ’em out there in your garden beds and let ’em grow. When they start to blossom, you can leave them for the bees for a couple of weeks, but then use your lawn mower and chop it down. Mow over it a couple of times to chop it up and then dig it into your beds. Be sure to do this when you see from the weather report that you’ll get a good rain within a couple of days. Then wait two weeks, spade over your garden beds again, and plant into them.